The seventh cycle of accelerated performance testing launched this year at the NCAT Test Track and consists of new mixture performance sections, instrumented structural sections, and extended traffic sections. Initially constructed in 2000, the NCAT Test Track is a 1.7-mile oval comprised of 46 main test sections sponsored on three-year cycles. The track is circled by a fleet of heavily loaded trucks resulting in 10 million equivalent single axle loads (ESALs) of traffic while the performance of each test section is closely monitored over a period of two years. Forensic analyses of damaged sections are then performed to determine the contributing factors to pavement distresses. Investigations conducted during this stage include destructive testing such as trenching and coring, as well as additional laboratory testing as needed. Test sections are either reconstructed or remain in place for additional evaluation during the next cycle. 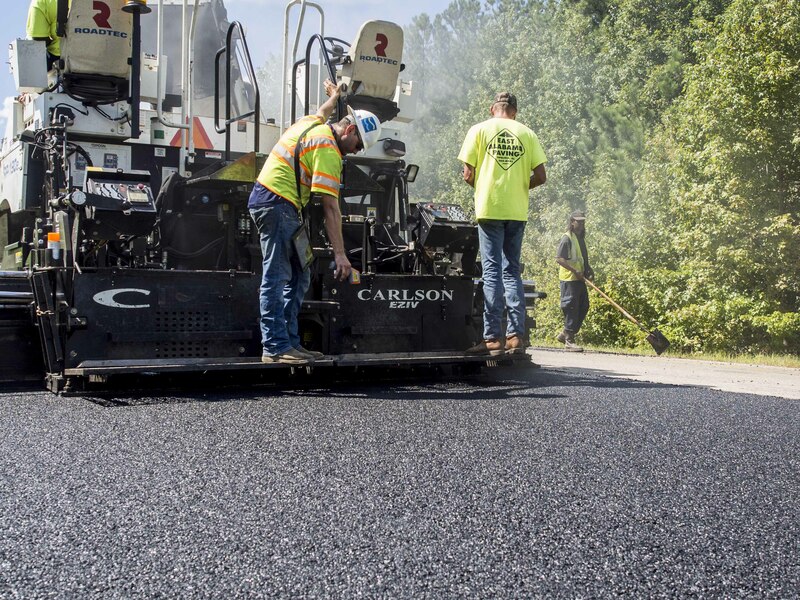 The 2018-2020 cycle includes continuing studies and new experiments in areas such as balanced mix design, rejuvenators, pavement preservation, and reflection cracking. Several new experiments for the seventh cycle are detailed below. Cargill is sponsoring parallel testing at the Test Track and the Minnesota Department of Transportation’s MnROAD facility to determine how to best implement balanced mix design procedures in asphalt mixes containing rejuvenators and high levels of reclaimed asphalt pavement (RAP). As part of the project, test sections made with Cargill’s Anova rejuvenator and a 45% RAP mix will be compared to control sections with lower RAP contents, measuring factors such as pavement ride quality, cracking, and rutting. By conducting experiments at both the Test Track and MnROAD, researchers will be able to monitor results in both northern and southern climate extremes. Density is verified on Section N3 during the compaction process. 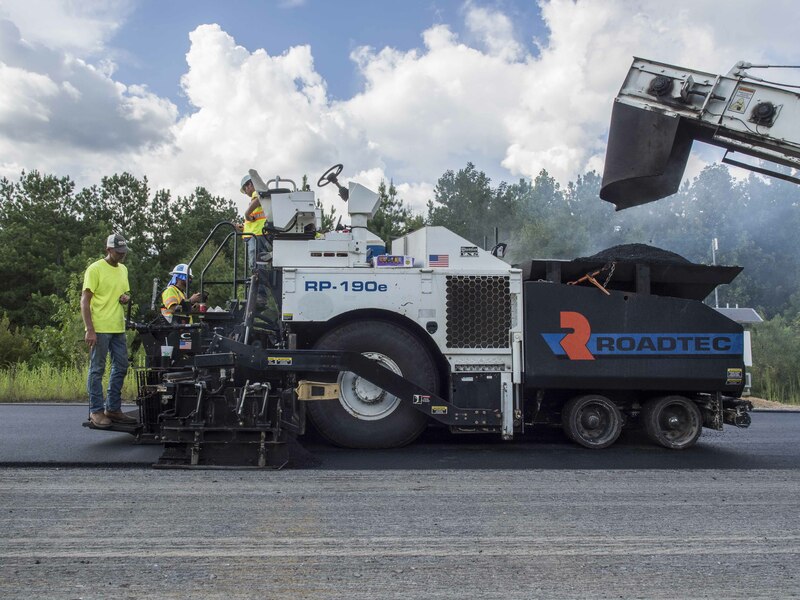 The objective of the Alabama Department of Transportation’s (ALDOT) study is to evaluate thinner overlay alternatives that are a durable option for pavement preservation. Thinlays are thin asphalt overlay mixes typically designed to be placed as thin as 5/8 of an inch. Section N10 is a 4.75 mm nominal maximum aggregate size (NMAS) stone matrix asphalt (SMA) mix with a PG 76-22 binder. The Thinlay in N10 was placed at a thickness of 0.8 inches. Section N11 is a 4.75 mm dense-graded mix with a PG 67-22 binder. The Thinlay in N11 was placed at a thickness of 0.5 inches. A structurally sound pavement is needed in order to assess Thinlay performance. Therefore, a new intermediate asphalt layer was paved prior to the placement of each Thinlay. A Thinlay is placed on an intermediate layer in Test Track Section N10. The objective of the Florida Department of Transportation’s (FDOT) study is to evaluate the effect of changes in density on mixture durability. Recent national efforts have increased attention on raising in-place densities to improve durability. Sections E5 and E6 have the same mixture, which is a fine-graded mix with 20% RAP and a PG 64-22 virgin binder. Both sections were divided into two subsections to result in four 100-foot subsections. The difference among the subsections is the density. E5A has a target 94% density, E5B has a target of 92%, E6A has a target of 90%, and E6B has a target of 88%. The laboratory portion of this study will include cracking and moisture susceptibility performance testing along with rheological and chemical tests of the extracted binders from each subsection. The field evaluation will be typical for the track and includes cracking, rutting, texture, and roughness (IRI). Section E5A is paved on the east curve of the Test Track. The Georgia Department of Transportation (GDOT) aims to find a cost-effective approach to reduce reflective cracking. The agency’s traditional approach has been to place a single surface treatment application with No. 7 stone over the existing surface before overlaying. The open texture of the surface treatment is believed to spread out high strains at cracks or joints in the existing pavement so that underlying cracks are dissipated rather than reflected through to the surface. This approach, however, has not been as effective as desired. 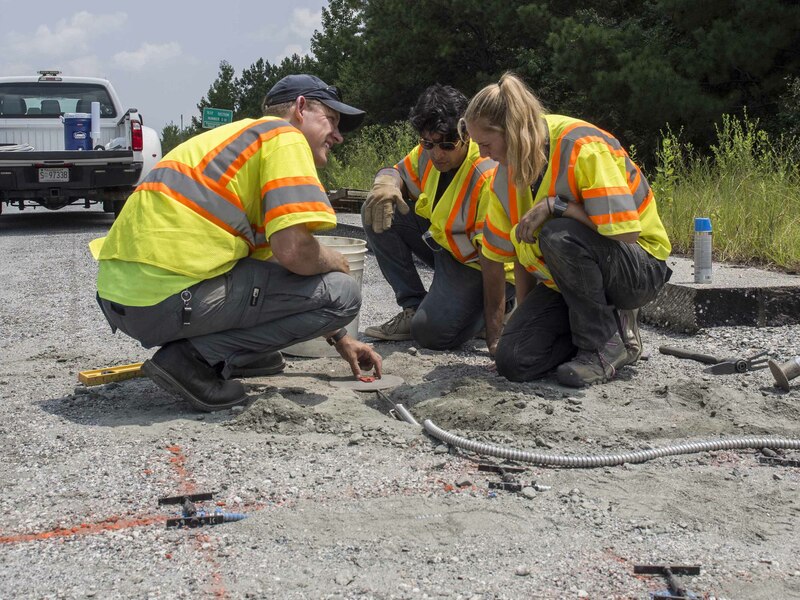 In 2012, GDOT sponsored two test sections (N12 and N13) to evaluate two methods for reducing reflective cracking. One section used a double surface treatment with sand seal coat, and the other used an open-graded interlayer. After 20 million ESALs of trafficking, only 6% of the saw cuts in the double surface treatment section reflected through to the surface, while 51% of the saw cuts reflected through to the surface in the open-graded interlayer. 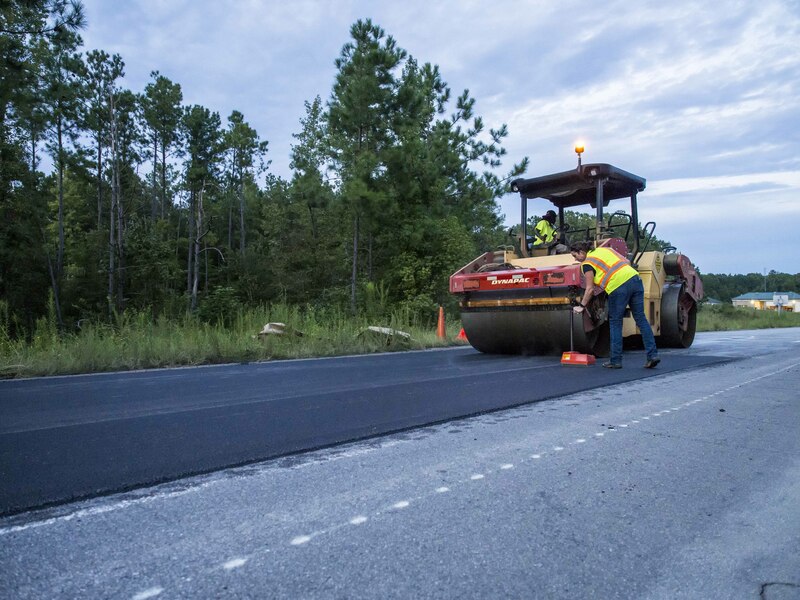 GDOT is continuing to sponsor these two sections and adding six other treatments including a PETROMAT® fabric interlayer, a GlasGrid® interlayer, a chip seal with No. 7 stone, a chip seal with fractionated coarse RAP, an open-graded interlayer with an Ultrafuse® tack coat, and a rubber modified asphalt interlayer with Ultrafuse®. The sections have the same saw cut pattern and surface overlay mix as the 2012 GDOT test sections. Therefore, the factors affecting the reflective cracking performance are only the treatment methods. The Mississippi DOT (MDOT) often faces challenging soil and aggregate base conditions when building or rehabilitating asphalt pavements. One approach has been to use lime and/or cement to stabilize the roadbed soil and base before placing the asphalt concrete layers. The new MDOT-sponsored structural section, S2, is meant to replicate common practice in Mississippi and provide valuable data for verification, calibration, and validation of mechanistic-empirical (M-E) design approaches. Section S2 was excavated before the placement of 48 inches of a high plasticity Mississippi clay subgrade. The upper 6 inches of the MS subgrade was lime treated. The next 6 inches was a dirty-sand base layer treated with cement. Both layers were cured according to MDOT’s specifications before placing the asphalt layers. The section is fully instrumented with pressure cells, strain gauges and temperature probes to provide critical data needed for M-E analysis. Section S2 is excavated and filled with native Mississippi subgrade prior to a lime stabilization treatment. The Mississippi and Tennessee Departments of Transportation are each sponsoring a rejuvenating fog seal experiment during this cycle. NCAT conducted a preliminary study to evaluate eight fog seals to determine which products would be used on the Test Track sections. The Federal Aviation Administration’s procedure P-632 (Bituminous Pavement Rejuvenation) was used to evaluate extracted binders two and four weeks after the application of the eight products on aged 1.5” mill/inlay asphalt pavement sections. Pavement surface friction characteristics after each fog seal application were also used in the screening process. The results were presented to MDOT and TDOT to assist them in the decision of which fog seal products to use on their respective Thinlay test sections. 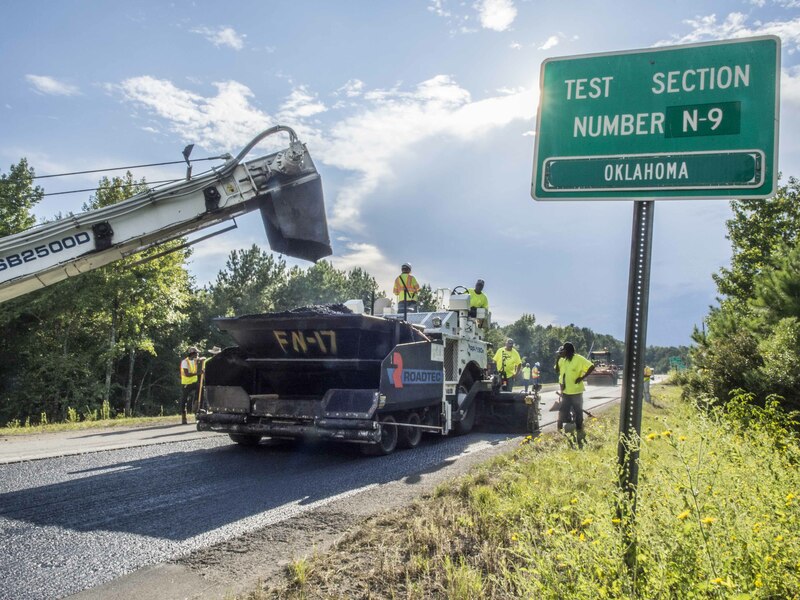 The overall objective of the Oklahoma Department of Transportation’s (ODOT) experiments is to gather information to assist in implementing performance tests and criteria for balanced mix design. Oklahoma’s new balanced mix design approach uses the Hamburg wheel tracking test to evaluate rutting resistance and the Illinois Flexibility Index to evaluate cracking resistance. Section N9 is a 2-inch mill-and-inlay using an ODOT 9.5mm NMAS mix containing 15% RAP and a PG 76-28 modified binder. Section S1 is a 5.5-inch mill-and-inlay using a 12.5 mm NMAS mix as the surface course over a 19 mm NMAS base course. Both mixes use a PG 70-28 modified binder. The surface mix has 12% RAP, while the base mix contains 30% RAP and a rejuvenator. Section N9 is placed on the north tangent of the Test Track. 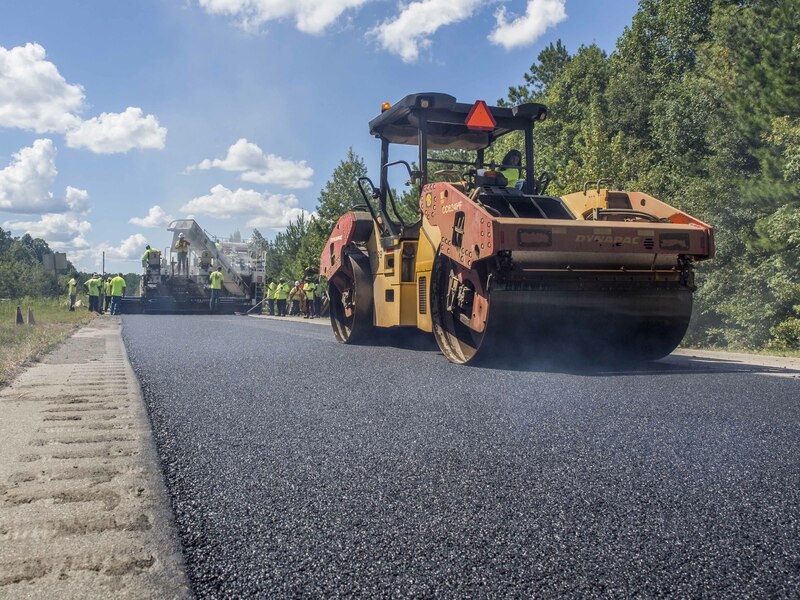 The South Carolina DOT (SCDOT) has experimented with a full-depth pavement reconstruction method using a single, thick lift of asphalt. The method includes milling the existing distressed pavement to depths of 4 or 5 inches and constructing a new inlay in a single pass. While this approach has been successful at these depths, SCDOT is interested in using even thicker mill and inlays. Key questions regarding compaction, mat cooling, and long term performance of extra thick lifts will be answered with their section, S9, which is a 7-inch thick single lift section. The section was instrumented during construction with pressure plates and strain gauges to measure long-term structural response of the section. During paving, the section was also monitored with embedded thermocouples to measure in situ temperatures and thermal imaging to capture surface cooling. David Timm, Civil Engineering Professor at Auburn University, works with graduate students Mostafa Nakhaei and Caroline Taylor to place instrumentation in Section S9. The Texas Department of Transportation (TxDOT) recently developed a special specification for balanced mix design that uses the Hamburg wheel tracking test to evaluate mixture resistance to rutting and moisture damage and the overlay test for assessing cracking resistance. Their objective is to compare the field performance of asphalt mixes designed using their balanced mix design approach (Section S10) versus the Superpave volumetric approach (Section S11) under accelerated loading conditions. Both sections were constructed as 2-inch mill-and-inlays. The two mixes are similar in many respects; both have 20% RAP binder replacement, 0.5% liquid antistrip additive, and 9.5 mm NMAS with similar gradations. The primary difference is that the balanced mix design has a 5.5% total binder content, which is 0.5% higher than that of the volumetric control mixture (5.0%). Assistant research engineer Grant Julian checks the temperature of Section S10 during placement. The United Soybean Board has been sponsoring research at Iowa State University to develop a biopolymer derived from soybean oil. To bring this product closer to adoption, a new experiment is being carried out in this research cycle to evaluate a surface mix produced with a PG 76-22 asphalt binder that has been modified with the biopolymer. The field performance of this experimental mix in Section W10 will be compared with that of another surface mix in Section E5, which was produced with a conventional polymer modified PG 76-22 asphalt binder, to determine the effect of the biopolymer. Except for the two different asphalt binders, both mixes were produced based on the same 12.5-mm NMAS mix design with 20% RAP and paved as 1-3/4-inch mill-and-inlays. The West Virginia DOT is a new sponsor on the Test Track and has funded an experiment to help determine an appropriate limit for the amount of dolomite in surface mixes that will provide good friction characteristics. The experiment includes a laboratory study of mixtures with increasing amounts of dolomite from 50 percent to 100 percent of the dominant coarse aggregate for friction. The experimental mixtures on the two test sections have 70 percent and 90 percent dolomite coarse aggregate. Based on previous friction studies involving the Track and NCAT lab accelerated friction protocol, the experiment should give WVDOT a sound correlation for selecting an appropriate amount of dolomite for surface mixtures. The Test Track sections were constructed as common 2-inch mill and inlay of a 3/8-inch NMAS mix using all WV common aggregate sources for dolomite, sandstone, limestone, and RAP. The direct substitution of dolomite for sandstone kept the volumetric properties and field density similar and close to mix design targets. 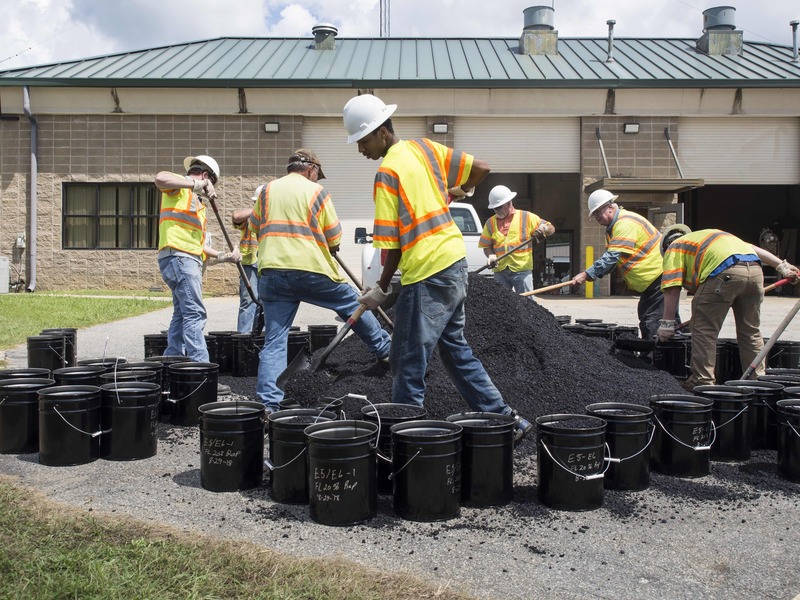 NCAT employees and students shoveled over 1000 buckets of asphalt mix during construction for laboratory testing. Several test sections built in previous cycles will also continue to be evaluated through the seventh cycle of the Test Track. Seven test sections built in 2015 for the Cracking Group Experiment will continue to be evaluated with additional traffic and environmental exposure. The objective of the Cracking Group Experiment is to validate laboratory tests suitable for routine use in mix design and quality assurance testing. It is an experiment being conducted in partnership with MnROAD where the NCAT Test Track sections are focused on top-down cracking and the Minnesota test sections are focused on thermal cracking. 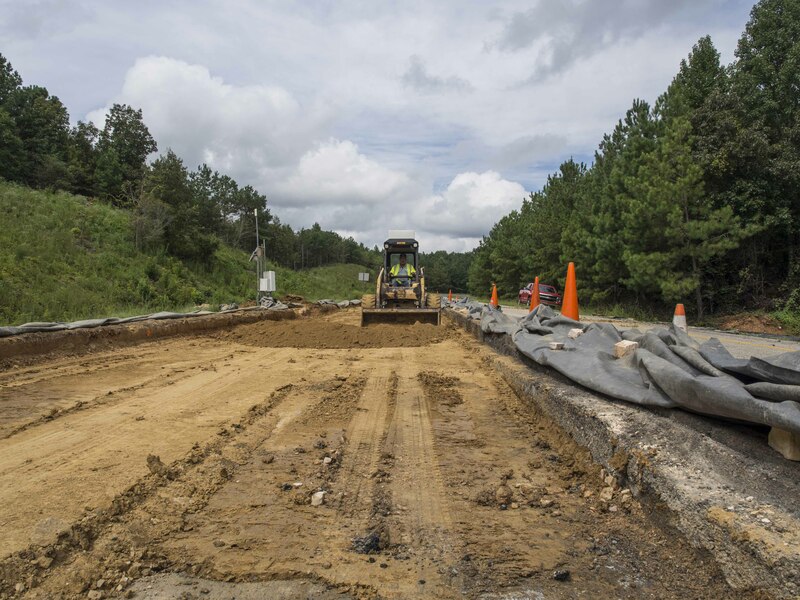 The Virginia DOT is funding the continued evaluation of two test sections built in 2012. One test section features a 4.5-inch cold-central plant recycling (CCPR) base layer below four inches of asphalt concrete. The other section features an 8-inch cement stabilized sub-base, the CCPR base layer, and 4 inches of asphalt concrete. The Alabama DOT is funding the continued evaluation of three experimental porous friction course (PFC) test sections also built in 2012. One section is a 9.5 mm NMAS PFC, and the other two are 12.5 mm NMAS PFC mixtures. The 9.5 mm NMAS mix contains 0.3% cellulose fiber to prevent drain-down. One of the 12.5 mm NMAS PFC mixes contains 0.05% synthetic fiber and the other contains 12% ground tire rubber. 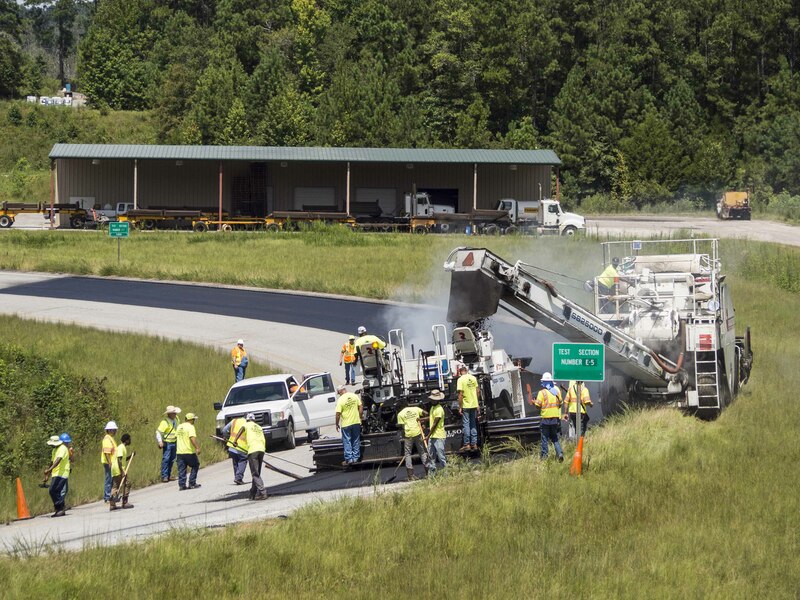 The Kentucky Transportation Cabinet is funding the continuation of an experiment to evaluate the performance of Superpave surface mixes for longitudinal joint performance and durability. The experiment contains two subsections, one using a conventional coarse-graded Superpave mix, and the other using a fine-graded, lower-gyration mix design. The surface layers were constructed in both the inside and outside lanes of the Test Track to specifically evaluate longitudinal joint performance of the mix variations. The Florida DOT is funding the continued evaluation of an experiment with four surface mixes containing 20 to 30% RAP. The Superpave mixes were 9.5 mm NMAS gradations and all used the same aggregate and RAP. The first three mixes contain a PG 76-22 SBS modified binder with 20, 25, and 30% RAP, respectively. The fourth mix contains a PG 67-28 SBS modified binder and 30% RAP. Collaborative Aggregates is funding the continued evaluation of the surface mix containing their bio-based Delta S rejuvenator and 35% RAP. The test section was built in 2018 and is being compared to the 20% RAP control test section in the Cracking Group experiment.